Making headlines again today is good old North Korea, after their decision yesterday to shut down the last military communication hot line that connects the two Koreas. This is the most significant and hostile move to come from Kim Jong-un since he succeeded his late father as leader of North Korea in 2011. Up until now, Mr. Kim has primarily stuck to harsh dialogue, rarely acting on his threats up until the nuclear test that came earlier this year. And as I wrote about earlier this year, North Korea consistently and steadily ramps up their aggression, using their words and actions intermittently with one another. Their nuclear test this year was the third since 2006, and was by most accounts successful - clearly North Korea has developed nuclear technology and may be capable of producing small, yet still powerful nuclear weapons. After sanctions coming from the UN, Mr. Kim threw a hissy fit and threatened combat with not only the U.S., but South Korea and Japan. Threats coming from the country have been so extreme as to actually receive condemnation from China, who traditionally sticks up for North Korea in these types of situations. Now, North Korea has begun prepping its arms for a possible strike, which could reach as far as Hawaii and Guam (and maybe even California), and has prepped its forces for possible combat with South Korea and Japan. There is no room left for threats, and no further actions the North could theoretically take short of armed aggression. So what is going to happen? 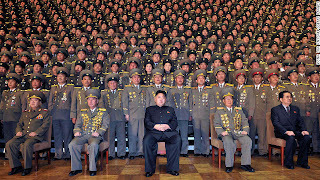 "My army's bigger than youuuurss"
Well, I'm sure everyone reading this is tired of hearing me write about North Korea. And, believe me, I am tired of writing about them. North Korea is, in the most accurate metaphor, the drunk friend we all have (if you are saying "I don't have that friend," then it is probably you) who has lost touch of the reality when it comes to their size and power, and picks fights with the biggest dudes at the bar. It almost always blows over after much drama ensues. And usually, that person's friends are there to back them up, albeit reluctantly. But sooner or later, the drama gets old, the recipient of the aggression fights back, and there are no friends to back that person up. North Korea has reached the end of the line here, and it seems to me that Mr. Kim truly has no sense of reality when it comes to international order, and North Korea's relative size and strength compared to the rest of the world. The incessant drama and belligerence was funny at first, but it is starting to grow old. I am not going to attempt to predict what will happen next, because Mr. Kim has proven to be unreliable and outrageously erratic - even more so than his wacko father. Maybe he will go through with his threats finally, and attack South Korea. If this happens, North Korea will fight a losing battle, and they will likely fight it alone; China will not come to their rescue. Japan would probably assist South Korea in effectively wiping North Korea off the face of the earth, and it would surprise me if there were many nations that would condemn the action. Or, North Korea will back off once again. But in doing this, Mr. Kim will have once and for all demonstrated that he is all talk, and is incapable of ever taking action against other countries when he knows it will end in disaster for him and his people. While this evokes rationalism on Mr. Kim's part, it also will be met with a huge, collective sigh from the rest of the world, as it means we are in for a long era of drama and unwarranted aggression from North Korea. I don't support war - I am a firm believer that armed conflict should be the absolute last action to take place in any circumstance. However, part of me wants North Korea to go through with their threats, the same way Saddam Hussein did in taking over Kuwait in 1991. 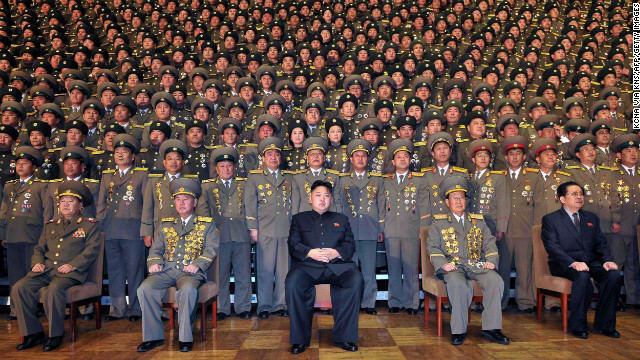 Perhaps a quick and effective war would help remind Mr. Kim of his place in the world. On the other hand, the less violence the better, and while the drama will continue to annoy the rest of the world, perhaps it is better than the alternative. My colleague Vicky and I have set the over-under for armed conflict at 72 hours. Which do you take?